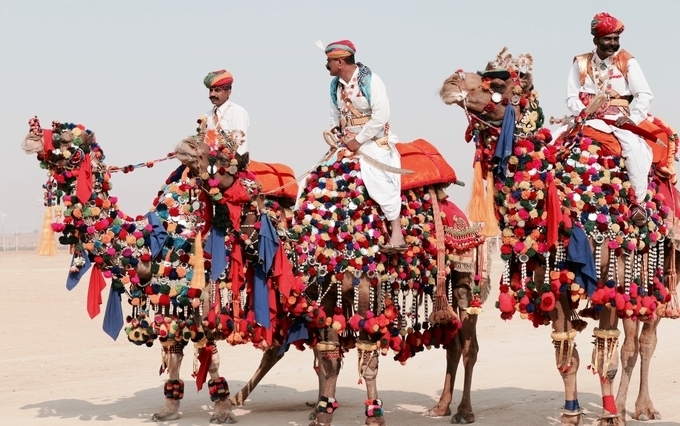 Haven’t explored the land of the desert kings – Rajasthan yet? Planning a tour to Rajasthan? If you are then now is the best time to visit this fabulous and historic destination. Of course, November is not only the beginning of winter in Rajasthan, but it is also the time when you enjoy the Pushkar Mela that sees close to 30000 camels on its fairgrounds. 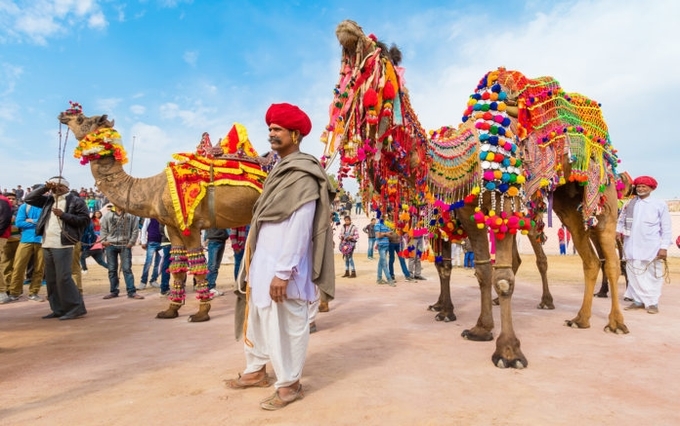 Also called the Camel festival, Pushkar is bedecked in a variety of colours and is one of the best ways to enjoy a traditional Mela of the olden times. This Pushkar festival was first introduced to lure cattle and camel traders for a meeting during the sacred Kartik Poornima festival (Full moon festival). A celebration of umpteen colours, traditional music and dance, delicious food and plenty of friendly competitions is what this fabulous festival is all about. Of course, there are the stunning golden sand dunes that you can enjoy. Get a chance to make cherished memories for your life when you visit the Pushkar Mela. When is the Pushkar fair celebrated? The Pushkar Fair is celebrated during the sacred Kartik Poornima every year. According to the Hindu lore, the full moon day in the lunar month of Kartik is considered to very favourable. 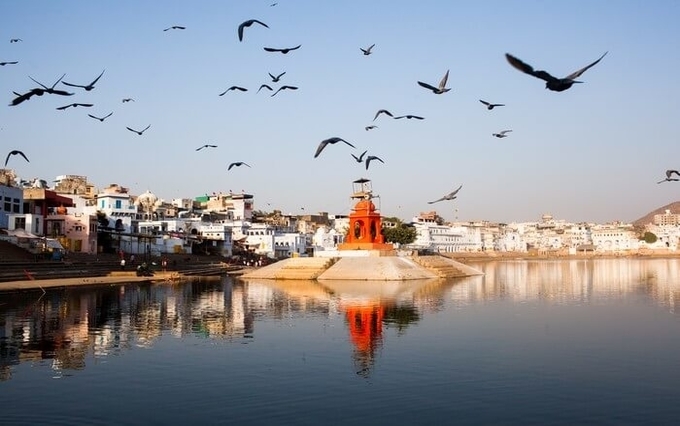 Travellers from all over the world and India flock to this town to take a dip in the consecrated waters of the Pushkar Lake and pay obeisance to Lord Brahma. For this year the Pushkar Mela will be held from 15th November to 23rd November. Where is the Pushkar Mela held? 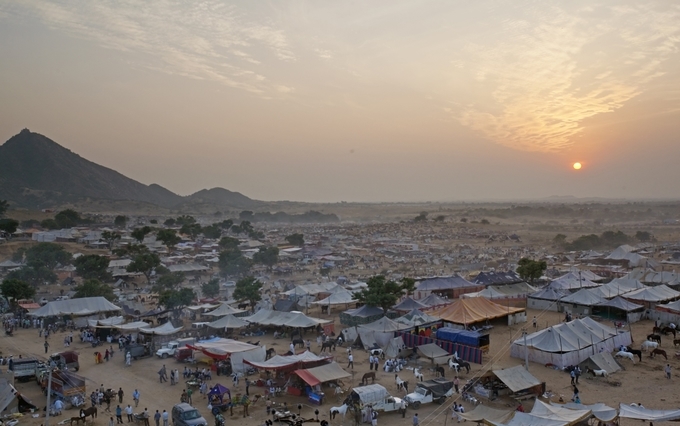 The fair is held in the town of Pushkar in Rajasthan, which is located at the edge of the Thar Desert. Pushkar has been one of the pilgrimage places in India like the Jagganath Puri, Rameshwaram, Badrinath and Dwarka. Ancient lore says, Lord Brahma vanquished the evil spirit Vajra Nabh in a battle with his Lotus flower. The petals supposedly broke and landed on earth around the town of Pushkar, where the lake sprang up. The Pushkar temple near the lake is worth a visit. It is the only temple in India that venerates Lord Brahma. This festival lasts for 5 days and the last day is one of the most significant as it was the day when the lake sprung up in Pushkar. A dip in this venerated lake is said to wash away your sins. Among the several competitions held during the fair, there are two that you absolutely must not miss. The camel beauty content is the main attraction at this festival where the camels are adorned in colourful designs and dressed to look their best. All the camels take part in the parade. The fun comes into picture when the camels throw the riders off their back. The camel with the most individuals riding it wins the competition. Of course, the most majestic among them wins the beauty title. Another competition you must check out is the moustache competition for the men who compete for the best facial tresses title. Other things you can try at the Pushkar fair are hot air ballooning, horse or camel rides, a sunset safari, and quad bike racing. Accommodation during this time of the year is at a premium, so plan your vacation well before time. Connect with Kesari Tours for more details.